We live in a time where we need not fly across the globe to see exotic plants and animals. Some of these exotic species are purposely transferred from one place to another, whether it be for their beauty or utility. Others species, however, tag along with these intentionally-brought species or products. When a species is released into a foreign habitat, whether intentionally or not, it becomes an invasive species if it’s presence is harmful to this new environment. The United States and other countries are working on creating a legal means to help combat the growing problem of invasive species. Unfortunately, this is a situation in which fault is difficult to determine and it is not unusual for the release of a non-native species into the wild to go largely unnoticed until the harmful effects of its presence appear. Thus, much of what can be done is damage control. The problem is complex though, requiring continuous analysis of the problems in a specific ecosystem and creation of solutions. The required specificity has been recognized in several efforts, including in an executive order issued by President Obama one year ago. The maintenance of a council in charge of this specific analysis and the call to individuals to take part in creating solutions, both included in this executive order, are important steps in slowing and reversing the harmful effects of invasive species. Invasive species affect plants, animals, humans, and even the economy. Some problems seen on and off in the media over the past decade include the Burmese pythons that are devastating the ecosystem of the Everglades and several species of mussels that are clogging pipes in the Great Lakes and California. About forty-two percent of threatened or endangered species are in danger of becoming extinct and billions of dollars are lost in the United States because of invasive species. In 2012, The United States Fish and Wildlife Service reported that the nationwide economic damage caused by invasive species is around $120 billion per year. They also reported that they had already spent over $6 million in efforts to get rid of the Burmese python since 2005, and the snake is still spreading and wreaking havoc on Florida wildlife. Zebra mussels alone are estimated to cost each water treatment facility $30,000 a year to remove. Over the past several decades, governments and individuals have made efforts to decrease the harmful effects of invasive species. For example, the Florida Fish and Wildlife Commission sponsors hunts for Burmese pythons and many lake authorities require boat inspections to check for hitchhiking mussels. This is only a start though. Recognizing this, governments have taken some action by forming agreements. Many of these agreements, such as UNCED 1992, are not binding, but they embody the global consensus that something should be done to solve this major issue. In December of 2016, President Obama signed Executive Order 13751, amending Executive Order 13112, which was signed by President Clinton in 1999. President Obama’s amendment strengthened and clarified the language asserting the purpose of the existing National Invasive Species Council, reaffirming the seriousness of invasive species and the need for cooperation among entities to have any hope of solving the problem. The executive branch is not the only body which has recognized this problem. Since the 1960s, the US legislature has enacted laws which cover efforts to protect a variety of species and ecosystems. The eradication and control of invasive species is an integral part of this protection. In 2015, Representative Mark E. Amodei of Nevada introduced a bill calling for the Departments of the Interior and Agriculture to create a plan to reduce the number of invasive species on the lands under their control by five percent every year. While this bill did not make it out of subcommittee, a similar bill was introduced in March of this year that specifies the allocation of funds and generalizes the annual amount of reduction of invasive species to “whatever is most practicable.” This bill is still being considered, but its similarity to the most recent executive order suggests a common direction in how the US government is dealing with the problem. In July of 2016, the National Invasive Species Council, a body created by the Clinton Executive Order, created a management plan. Importantly, it stated that “whether or not a non-native species is or will become harmful is context dependent; the risks change among localities and through time.” The creation and continuation of the NISC is important precisely because there is no single best way to eradicate and reduce the spread of invasive species. Interestingly, one of the actions listed in the management plan is to advise the president on how to improve the Clinton executive order. The changes made are not major, but do reflect the increased urgency in finding ways to lessen the harm done by invasive species. A policy statement was added to the beginning, explaining directly in the order why this problem is so important. It calls for cooperation between private and governmental entities within and without the United States. It also makes an effort to specify the problem, replacing “species” with “organism” to clarify that it does not take a lot of contamination to do harm. The other important change to the order was that it emphasized using technology and the cooperation of individual citizens to effectively track the problem and best find ways to resolve it. The president has the power to set the mood, but others must still choose to act. Obama’s executive order changed little as a practical matter, but reinforced a focus on the seriousness of the harm done by invasive species to many aspects of our country. It followed what international agreements and individual Representatives have tried to push in the hopes of affecting government action: that this is a problem which must be taken seriously. Taking action can reduce the negative effects caused by invasive species, especially if that action involves cooperation and the constant monitoring of situations and implementing of individualized plans to reduce and reverse the damage done. *Brianna Potter is a junior editor for MJEAL and can be reached at blpotter@umich.edu. Rebecca G. Harvey et al., University of Florida Wildlife Ecology and Conservation Department. Burmese Pythons in South Florida: Scientific Support for Invasive Species Management (2008); Mark S. Hoddle, Quagga & Zebra Mussels, http://cisr.ucr.edu/quagga_zebra_mussels.html (last visited Nov. 27, 2017). US Fish and Wildlife Service. The Economic Cost of Large Constrictor Snakes. (2012). Nancy A. Connelly, et. al., Economic Impacts of Zebra Mussels on Drinking Water Treatment and Electric Power Generation Facilities. Environ Manage (2007) 40: 105-112. Maria Bakkalapulo, Hunting for Burmese pythons in Florida’s Everglades. (May 31, 2017), http://www.dw.com/en/hunting-for-burmese-pythons-in-floridas-everglades/a-39062711. Hoddle, supra note 3; Bakkalapulo, supra note 7. Rio Declaration on Environment and Development, Rep. of the UNCED, U.N. Doc. A/CONF/151/26 (1992). Exec. Order No. 13,751, 3 C.F.R. § 13751 (2017). Exec. Order No. 13,112, 3 C.F.R. § 13112 (2000). Federal Lands Invasive Species Control, Prevention, and Management Act, H.R. 1485, 114th Cong. (2015). Id. ; Federal Lands Invasive Species Control, Prevention, and Management Act, H.R. 1330, 115th Cong. (2017). National Invasive Species Council, Management Plan: 2016-2018 (2016). 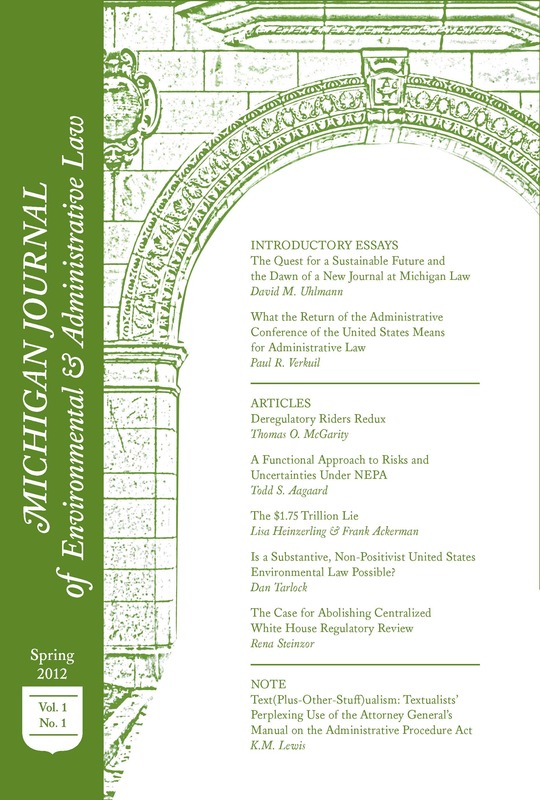 Prev Can the EPA Escape Enforcing Obama Era Ozone Protections Under the Clean Air Act?